People new to the world of homeopathic remedies may have previously heard of belladonna as a deadly plant. Although this is true, when belladonna is highly diluted, it transforms into one of the most important discoveries in homeopathy, and is known as homeopathic belladonna. When used in the right way, homeopathic belladonna can be very effective for acute pain and fevers, coughs and sore throats, headaches and migraines, as well as women’s health problems. When you experience acute symptoms with a sudden and violent onset, belladonna is often the remedy you want on hand. Belladonna comes from the plant Atropa belladonna—also called the deadly nightshade. That is because it has a history as a deadly poison, but it has also been used medicinally since ancient times. As a homeopathic remedy, belladonna is incredibly safe and useful for those that take it. Read on to learn more about homeopathic belladonna, including its history and its many uses, as well as its health benefits. The perennial belladonna plant is a member of the nightshade (Salonaceae) family, which also includes eggplant, tomatoes, potatoes, and chili peppers. Belladonna is native to Southwestern Asia, Northern Africa, and throughout Europe. 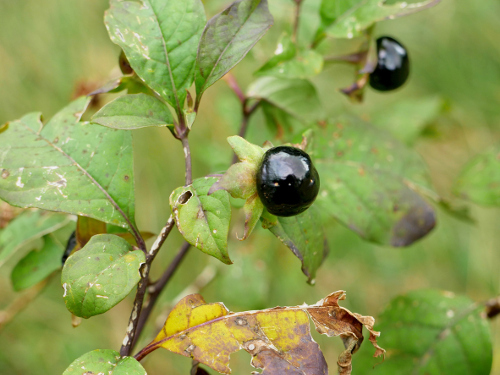 Today, it is even found in some parts of Canada and the U.S.
Belladonna is a shrub that grows up to five feet and contains poisonous berries that ripen from green to a shiny shade of black. It is the consumption of the berries, leaves, and root of the belladonna plant that can lead to death. Simply touching belladonna leaves can irritate the skin and cause a rash. Other potential harmful effects of the belladonna plant include convulsions, delirium, blurry vision, headaches, constipation, colic, severe cramping, sore throats, and bruises. Much of the history of belladonna is dark and deadly. The plant is named after the Greek Fate Atropos, who decided life and death over mortals. The belladonna berries were also thought to have poisoned Juliet in the Shakespeare classic, Romeo and Juliet. It is no wonder that some belladonna berries nicknames include sorcerer’s berries, murderer’s berries, witches berries, devil’s berries, and beautiful death. The actual name “bella donna” is Italian for “beautiful woman.” Italian women used belladonna to dilate their eyes to make them look more seductive in the 16th century. Despite its deadly reputation, it’s highly unlikely you’ve never used belladonna. It is sold as a supplement and is an ingredient in several medications. Also, belladonna is in the eye drops that your eye doctor uses to dilate your eyes. The medicinal benefit of belladonna is due to the chemicals called scopolamine and atropine. Atropine is used to dilate pupils, regulate the heart rate, and relax muscle spasms. Scopolamine is more effective at reducing stomach acid and motion sickness. When combined with phenobarbital and other medications, atropine and scopolamine can treat pink eye, motion sickness, spastic colon, irritable bowel syndrome, stomach ulcers, diverticulitis, Parkinson’s disease, and excessive nighttime urination. Homeopathic belladonna is considerably different than the herbal preparation. It is unlikely that any harmful effects will result from using homeopathic belladonna. A study published in the Journal of Psychosomatic Research in 2001 concluded that side effects from the homeopathic belladonna are most likely due to chance because participants reported similar effects with the placebo or no intervention at all. The discovery of belladonna is an interesting story, and it revolves around the homeopathic principle of “like cures like” where a substance that causes an illness can also contribute to the cure when highly diluted. Centuries ago it was noted that belladonna poisoning closely matched scarlet fever symptoms. As a result, homeopathy founder Dr. Samuel Hahnemann developed homeopathic belladonna. It is this discovery that helps lay the foundation of the “like cures like” principle. Homeopathic belladonna is often given to people who are fit and energetic, and also agitated and restless when ill. They are also prone to sudden explosive fits of anger. The person also experiences hypersensitivity to touch, noise, and light, and rapid temperature changes. What are the other health benefits of homeopathic belladonna? Over time, homeopathic belladonna was also found to treat the common cold or flu symptoms, acute pain or inflammation, convulsions, cystitis, inflamed kidneys, sunstroke, abscess, ear infections, eye inflammation, gallbladder conditions, measles, hypertension, arthritis, sinusitis, menstrual pain, and other women’s health problems. The following is further detail regarding the top homeopathic belladonna health benefits. Belladonna is considered a good remedy for the sudden onset of a fever after getting chilled or overheated. Accompanying symptoms will include a bright red and flushed face, glassy eyes, dilated pupils, a red tongue, and hot and dry skin. Skin inflammation will produce heat and redness that will also lead to a throbbing pain. The fever will commonly follow a sweating, which may advance into delirium. And, the person is often only thirsty for sour or lemony drinks. Belladonna is also used for osteoarthritis with red and swollen joints that become shiny and unbearably painful. The symptoms often improve from lightly being covered and sleep, but they worsen from light, motion, noise, and touch, as well as at night or around 3:00 p.m.
Homeopathic belladonna is also common for the flu or common cold symptoms, especially sore throats, dry coughs, fevers, and aches and pains. A dry, constricted, and burning throat is common, along with a tender neck and reddened tonsils on the right side. The person also has a constant need to swallow, although swallowing is incredibly painful, especially when they try to drink. Sitting, standing, and warm rooms improve symptoms, but they worsen from the nose, light, cold air, and movement, as well as at night, or lying on the right side. Belladonna is the go-to remedy for all sorts of women’s health concerns, including cramps, breast inflammation (mastitis), and painful menstruation (dysmenorrhea). Menstrual flow is extremely painful and heavy, and the blood during this time is hot, bright red, or clotted. Belladonna is also a useful remedy for menopause when a woman experiences vaginal discharge, uterine bleeding, nosebleeds, feverish delirium, violent anger, and an impulse to run. Belladonna is also a top remedy for relieving throbbing and violently painful headaches and migraines that may result from colds, sinus issues, or injuries. The person may also experience nosebleeds, and a desire to escape the world. The migraine will likely begin at the back of the head, and radiate at the right brow area of the head before the pain settles behind the eyes. Symptoms improve from lying in the dark, a cold compress, and putting pressure on the head; however, noise, light, and movement will worsen things. Belladonna is considered an appropriate remedy for acute hypertensive symptoms such as dilated pupils, a pounding headache, flushed face, great heat, and throbbing blood vessels. Rage and anger will also lead to hypertension. Japanese encephalitis is a deadly viral disease that kills about 10,000 people yearly. Survivors of the disease also suffer from poor coordination, seizures, mental disorders, and impaired cognitive function. Government agencies in affected areas and homeopaths have traditionally used homeopathic belladonna for the prevention and treatment of Japanese encephalitis. A study published in the American Journal of Infectious Diseases in 2010 found that belladonna was effective in controlling the encephalitis virus in infected chick embryos. The Zika virus is an infectious disease transmitted through infected mosquito bites. Symptoms will include fever, joint pains, headaches, conjunctivitis, and skin rash. Homeopathy has been very effective at treating epidemic diseases like the Zika virus. Belladonna is among the homeopathic remedies thought to come closest in treating Zika virus infection symptoms. Belladonna is a common remedy for eye inflammation or irritation, especially during the sudden onset of symptoms that include throbbing pain, visual illusions, light sensitivity, seeing red, heavy and swollen eyelids, dilated pupils, and dry burning eyes that are red and congested. Belladonna is useful for acute cholecystitis, which is inflammation of the gallbladder. Symptoms include fever, vomiting, nausea, abdominal tenderness and pain, and pain that radiates to the back or right shoulder. When belladonna is required, the pain will start and stop suddenly. An ear infection (otitis media) is the top health problem for children in the U.S. Belladonna is considered effective for ear infections, especially when the face and ears are flushed. The person also hears ringing, noises, and even their own voice. It is important to understand the difference between homeopathic belladonna and herbal belladonna, especially when purchasing the products over the counter at your local health food store or pharmacy. Nutritional herbal belladonna supplements are sold in tinctures, ointments, tablets, and pump sprays. Homeopathic belladonna, on the other hand, is found in pellets, liquids, gels, and teething tablets. Although there are potential side effects of herbal belladonna, homeopathic belladonna is completely safe and effective for many health concerns like fever, pain, sore throats, women’s health problems, eye inflammation, ear infections, gallbladder conditions, headaches, hypertension, and much more. It is a good idea to consult a homeopath to help determine if belladonna is the right fit for you based on your mental, physical, and emotional symptoms. Locke, A., Encyclopedia of Homeopathy: The Definitive Home Reference Guide to Homeopathic Remedies and Treatments for Common Ailments (New York: DK Publishing, Inc., 2000), 39, 193, 196, 201, 205, 222-223, 224-225, 232-233, 240-241, 246-247, 250-251, 252-253, 262-263. Walach, H. et al., “The effects of homeopathic belladonna 30CH in healthy volunteers—a randomized, double-blind experiment,” Journal of Psychosomatic Research, March 2001; 50(3): 155-160. https://www.ncbi.nlm.nih.gov/pubmed/11316508. Hershoff, A., Homeopathic Remedies: A Quick and Easy Guide to Common Disorders and Their Homeopathic Treatments (New York: Penguin Putnam Inc., 1999), 88-89, 105-106, 114-115, 118, 131, 139, 146, 149-151, 158-159, 162-163, 169, 175, 186-187, 214-215, 218-219, 258-259, 266-267. “Belladonna,” MedlinePlus; https://www.nlm.nih.gov/medlineplus/druginfo/natural/531.html, last accessed May 17, 2017. “Belladonna,” Home Remedy Central; http://www.homeremedycentral.com/en/homeopathic-remedies/homeopathy/belladonna.html, last accessed May 17, 2017. “Know Your Remedies: Belladonna,” HomeopathyPlus! ; http://homeopathyplus.com/know-your-remedies-belladonna-bell/, last accessed May 17, 2017. Lilley, D., “Belladonna,” British Homeopathic Association; http://www.britishhomeopathic.org/charity/how-we-can-help/articles/homeopathic-medicines/b/belladonna-the-mystic-dimension/, last accessed May 17, 2017. Sharma, V., “Homeopathic Medicines for Zika Virus Treatment and Prevention,” DrHomeo; https://www.drhomeo.com/fever/homeopathic-medicines-for-zika-virus-treatment-and-prevention/, last accessed May 17, 2017. “Japanese Encephalitis on the decline in State,” The Hindu; http://www.thehindu.com/thehindu/2003/04/02/stories/2003040204970400.htm, last accessed May 17, 2017. Bandyopadhyay, B., et al., “Decreased Intensity of Japanese Encephalitis Virus Infection in Chick Chorioallantoic Membrane Under Influence of Ultradiluted Belladonna Extract,” American Journal of Infectious Diseases, 2010, 6(2): 24-28; http://homeopathyplus.com/belladonnastudy.pdf. “Study: Japanese Encephalitis Controlled by Homeopathic Belladonna,” Homeopathy Plus; http://homeopathyplus.com/japanese-encephalitis-controlled-by-homeopathic-belladonna/, last accessed May 17, 2017.